"Your wedding day should be filled with incredible memories that will last a lifetime!" 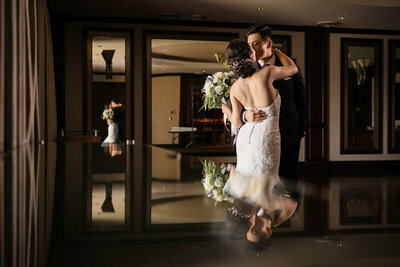 Some Chinese couples prefer to have an exquisite album ready for their ceremony. They display the treasured memento at the wedding. Guests see playful pictures of the betrothed couple deeply in love. The wedding hall also features large, poster-size pictures of the bridal couple. Luminous Weddings will take gorgeous, stylish photos to display in your photo album. We'll identify ideal locations around Toronto for your pictures. We'll even follow the groom and bride-to-be around the city. We'll shoot gorgeous, romantic photos that will illustrate your love story. Additionally, our photographers will take photos on the day of your wedding ceremony. We'll follow your day as it unfolds, taking pictures of traditional rituals, banquets, and the official tea ceremony. Our studio edits your photos in-house. We'll set them in gorgeous frames and a handcrafted photo albums made in Italy. The Chinese wedding ceremony is almost 2,400 years old. Some scholars say the traditions originated during the nation's Warring States period (402 - 221 BC). Three narratives discuss traditional marriage ceremonies. These include the Baihu Tong, The Book of Etiquette and Ceremonial, and The Book of Rites. Other researchers claim the wedding customs developed during the Zhou Dynasty (1046 - 256 BC) with "The Three Letters and Six Etiquette." The process involved matchmaking, astrological matching, and other rituals. The full ceremony was once too complicated, so they simplified it. Weddings are binding contracts. Families must meet financial and social contractual obligations to ensure the couple's success. Relatives encourage the bride and groom to produce children that will continue their lineage. They complete rituals to increase the couple's fertility. If you're looking for an amazing modern Toronto wedding photographer, Luminous Weddings is ready to help make your dream wedding a reality. For more information contact us today! Chinese weddings are celebratory occasions that blend sophisticated Eastern traditions with modern-day style. These reverent ceremonies honor the past and present, old and new. Newlyweds celebrate their new commitment while thanking their parents for their extraordinary sacrifices. We love Chinese weddings and we want to tell your story in rich detail through colorful, astonishing pictures. We offer timeless bespoke engagement, pre-wedding and wedding photography! 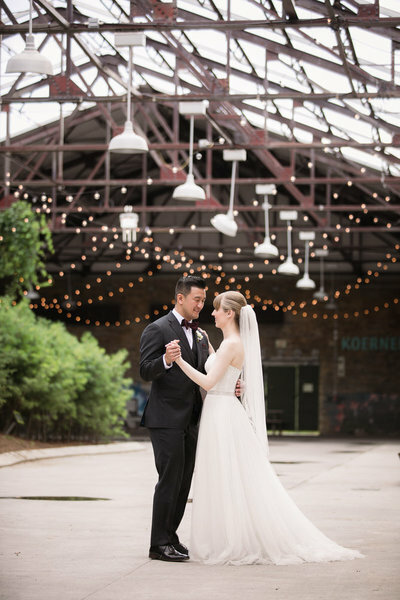 We follow a documentary-style photography process that tells your real love story. Each shot is artistic, elegant, and tasteful. We want to meet our clients before we even cover your wedding. Getting to know your unique personality helps us to catch underlying moments that define your love story. Luminous Weddings will use our knowledge to take fantastic pictures that reflect your culture, identity, and image. This time-honed process continues to impress our customers. You're excited to send out the invites but not yet! Traditionally before wedding invites are sent out, the couple will observe the Betrothal gifts custom. The groom will send an array of cakes, food and religious items to the bride's family as betrothal gifts. Both families will then select an auspicious date, in accordance with the lunar calendar to make sure the day selected is in line with the couple's zodiac signs. On the day of the wedding, the groom and his groomsmen are up and early. They have a task ahead, to get past the door and get to the bride. Traditionally, the groom will be greeted with "door games" at the door, pranks designed by the bridesmaids to make it hard for the groom to get to the bride. These game games can be rowdy, silly, creative and, sometimes testy, to make the groom prove his worth. Once all the obstacles and challenges are met, the groom will then be allowed to pick up his bride but not without first bribing the bridesmaids with red packets. Although many traditions have faded through the passage of time, the tea ceremony remains an integral part of the Chinese wedding. It holds great significance not just for the couple but for the parents and relatives. Tea occupies a significant meaning in the Chinese culture. Since a tea plant cannot be uprooted and can only propagate through cutting or seeds, tea symbolizes rootedness, loyalty, love and blessing for a happy marriage. The earliest written record of tea can be traced back to the Tang Dynasty (618-907). When the Tang princess married the Tibetan emperor, tea was on the dowry list. As the Song Dynasty popularized the art of drinking tea, it is not surprising that tea drinking became part of the wedding rituals. 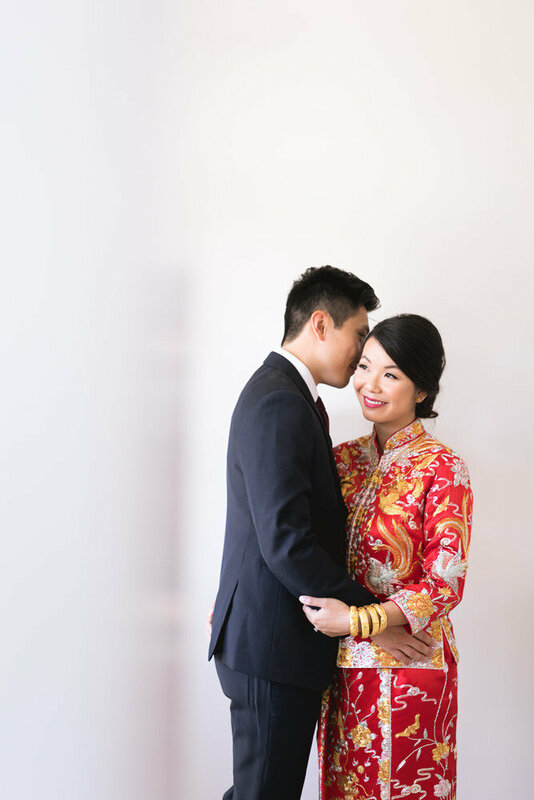 Traditionally, the bride will hold her own tea ceremony (or Jingcha in Chinese, meaning to "respectfully offer tea"), prior to the wedding day while the groom will hold it on the wedding day itself. In a contemporary Chinese wedding, for the sake of convenience, both families may opt to observe the tea ceremony at the same time. The couple offer tea to the families present, in order of seniority. 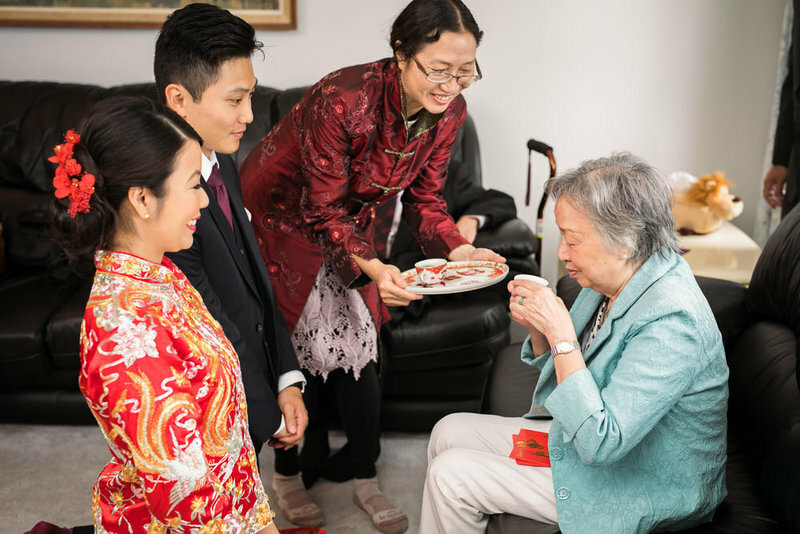 As the couple bow to offer the tea to the elders as a sign of respect and gratitude, the elders drink the proffered tea as a gesture of goodwill and blessings. The parents or relatives will also give laisee or gold jewelry at this time. For the bride, the choice of wedding dress takes precedence. Wearing the traditional dress, the qipao (旗袍), is considered an honor and makes for an exquisite photoshoot on top of that. The qipao is a one-piece body-flattering dress and red is the color of choice as it holds significance. Often, the bride will wear the qipao during the tea ceremony and during the reception dinner. Another option is the two-piece traditional attire, known as Qungua or QunKwa (裙褂). The Qungua is more popular in Southern China and the dress is often embellished with gold dragon (yang) or phoenix (yin) and since yin and yang complement each other, symbolizing marital harmony and bliss. If you enjoy a big dinner celebration with lots of fanfare, food and wine, opt for a traditional wedding banquet. A ten-course dinner is not unheard of, even though couples may decide on an 8-course or 6-course dinner. Often food has significance and, therefore, the choices of dishes are carefully selected. For instance, the suckling pig is almost ubiquitous, a symbol of bride's purity. A whole fish symbolizes abundance and for dessert, often, the sweet lotus seeds to wish the couple fertility. Throughout the dinner, the bride will make dress changes. She may start off with the white wedding dress, change into the qihao during the 3rd or 6th course and then into a wedding ball gown. They will also go around toasting guests by the table. Traditionally, a rice wine (or baijiu) is used for the toasts, and the groom will usually discreetly switch to water after a few rounds as baijiu has high alcoholic content. There are certain traditions that are so ingrained that they naturally become part of the wedding landscape. These small but significant details will also make for good pictures, great keepsakes for your auspicious day. Red is often the color of choice from the traditional wedding dress to decorating the suckling pig with red coloring. 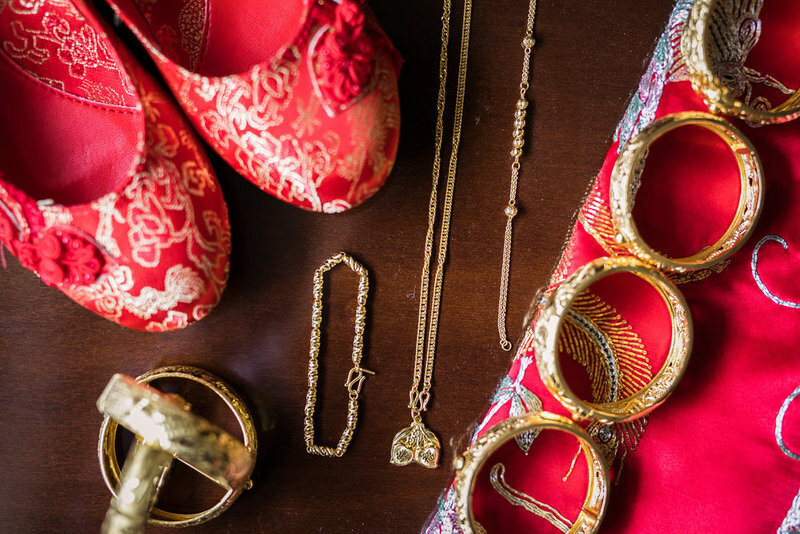 The Chinese people associate red with success, loyalty, honor, fertility, love and happiness. In the light of this, a lot the wedding decoration feature the red color. Gold is another favorite. It signifies wealth and fortune. On the other hand, some colors are taboo in the traditional Chinese wedding. White is frowned upon as it is associated with death and dark colors such as black, blue, gray are deemed unlucky and should be avoided as well. The preferred form of gifts is the red packet, otherwise known as hongpao or laisee. The giver puts cash into red packets, often bearing auspicious Chinese words. The parents and relatives give laisee to the couple during the tea ceremony. Invited guests to the wedding banquet are expected to give laisee as well. The amount given should be even. Often, guests drop off their laisee at the reception table. The use of the double joy character (囍), reserved only for wedding, are displayed prominently in the homes of the wedding couples and the wedding venue. Smaller versions are used on gifts and wedding items to grace the occasion. Banners with well wishes (often in gold and red) may be used to decorate the wedding venue as well. 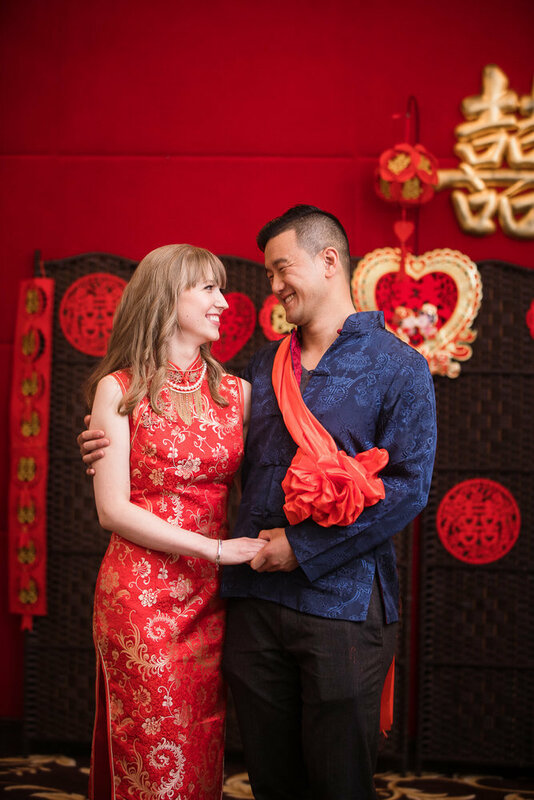 Incorporating traditional elements into a contemporary Chinese wedding is a great way of honoring your heritage and celebrating the richness of your culture. These beautiful moments are priceless and engaging a gifted and knowledgeable photographer will ensure these moments are poignantly captured.